Black gutters tend to adsorb heat (useful in aiding germination – but need water more often) whereas lighter coloured gutters tend to be cooler(requiring less irrigation) Flat bottomed gutters are the most versatile (as they don’t roll over) but it’s easier to slide plants out of round bottom gutters (it you intend to ultimately transfer them to a ground trench). DIY stores will often cut gutters to the length you require but often the normal delivered length will be three, four or more metres. You will need to decide on the most suitable length that you find easy to handle. We have found that gutters cut to between 1 and 1.5 meters (when filled with compost) are quite manageable when building systems. We have also built some systems with 4 meter lengths but you need strong arms to move the sections around ! Metal gutters are heavier, expensive and more difficult to handle. The best solution to irrigating plants growing in gutters is to have one end of the gutter higher than the other so that irrigation fluid will run from the higher end to the lower end. 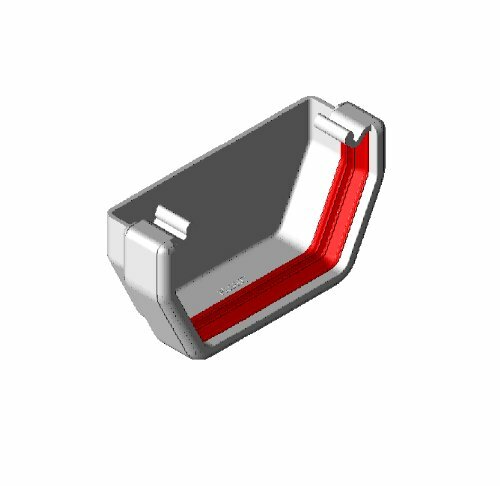 The higher end can be fitted with a sealed end fitting (where irrigation can be introduced) and the other lower end not sealed so that any excess irrigation fluid drains into a drip tray. It is possible to leave the draining end open but then there is the danger of compost or growing media being washed out of the open end. The push fit fittings mentioned earlier are an ideal solution as they contain the compost but also allow surplus water to drain out. 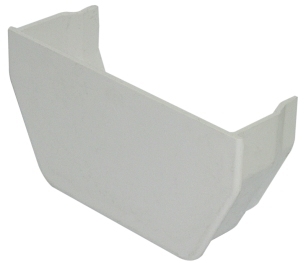 These fittings are best obtained at the same time and from the same supplier as the gutters to ensure they all fit together ! The supporting structure used to hold your gutters will need to be strong enough to support the weight of the gutters when filled with irrigated compost and also to hold them at an angle to facilitate drainage. You can easily adapt shelving units, tables, walls or many types of frame for GutterGrowing. It is useful to be able to adjust the angle of the gutters as this will vary the rate of drainage of any surplus irrigation water. This is easily done with frame structures but blocks or bricks can be used to vary the angle of less adaptable structures. Gutters should protrude over the end of the supporting structure so that gutters can drain into an optional drainage tray. 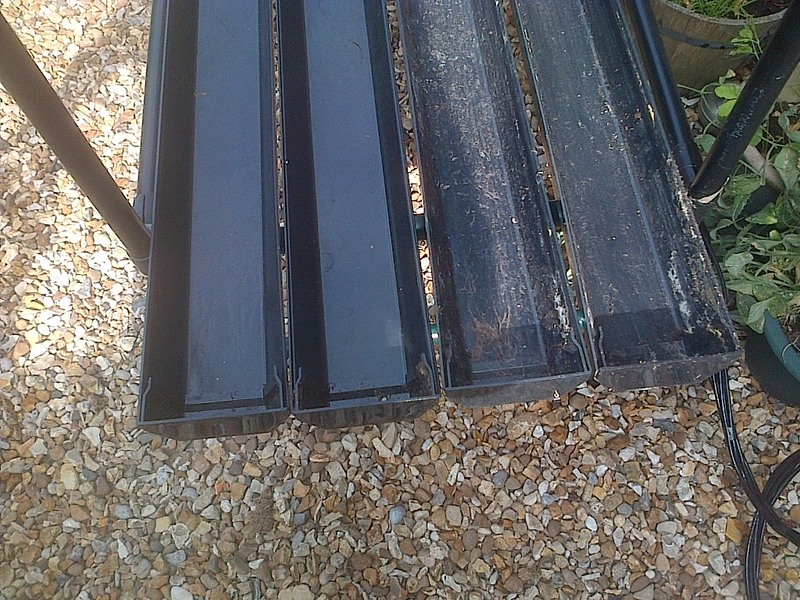 The pictures above show black gutters on a table for support with a box to keep them at an angle - the lower end has push fit fittings (for drainage) and the upper end has the sealed end fitting. A small amount of perlite has been added to the compost in the pictures above to aid with the drainage but this is not essential. Planted onions are shown in the last picture. Congratulations you are ready to plant out seeds and start growing ! 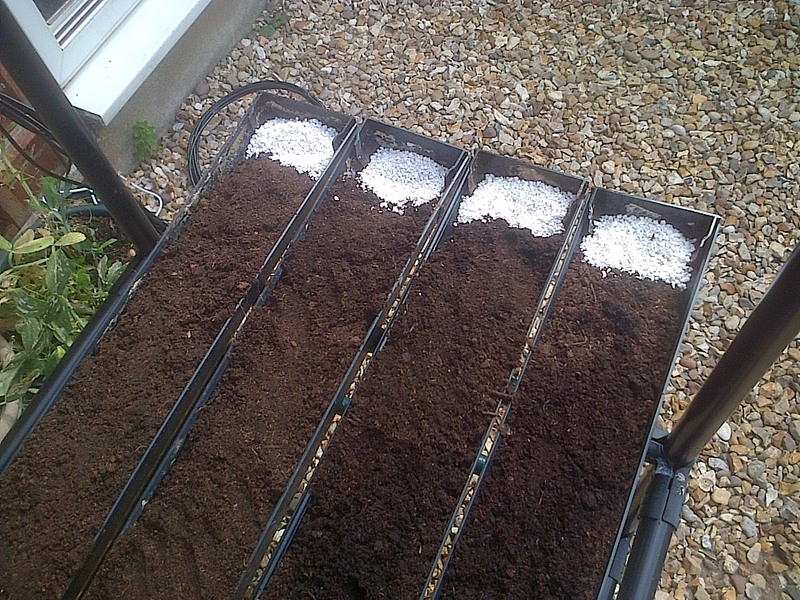 Operating a basic GutterGrowing system is much the same as growing plants in pots. Seeds need to be planted and fed and watered in accordance with instructions on the seed packet. Plant food can be placed at the upper sealed end of the gutter and then when irrigation water is introduced it will liquidise and carry the plant food down the length of the sloping gutter. 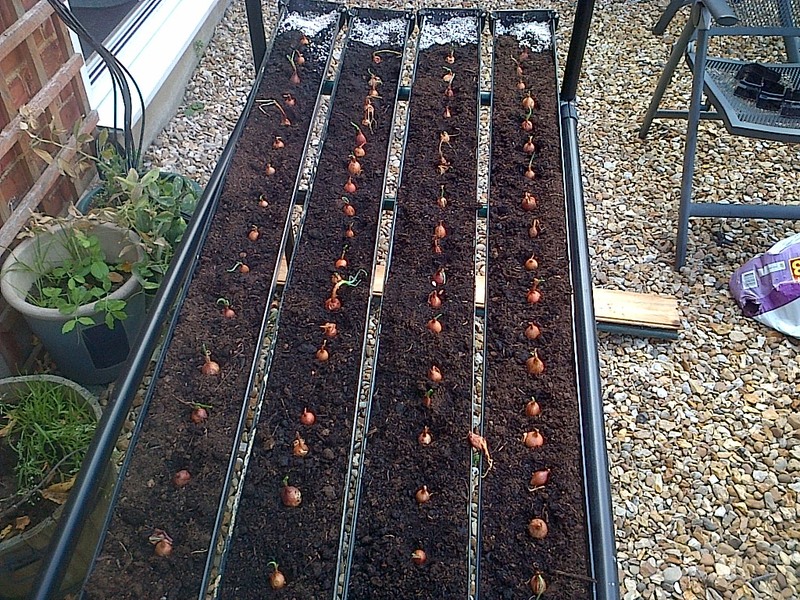 You can catch any excess in a drip tray and then re-use it as required. Daily checks and regular irrigation of a basic system will be necessary to ensure your plants are kept well. If you want to make life easier then the next simple project will automate your GutterGrow irrigation system with a tiimer leaving you free to take a well deserved holiday (yipee !! )..